The heavy-lift Ariane 5 with its Intelsat 33e and Intelsat 36 payloads is shown during today's rollout from the Spaceport's Final Assembly Building to the ELA-3 launch zone. Arianespace has delivered another Ariane 5 to the launch zone at Europe’s Spaceport in French Guiana, positioning this heavy-lift vehicle for tomorrow’s dual-passenger flight at the service of global satellite operator Intelsat. 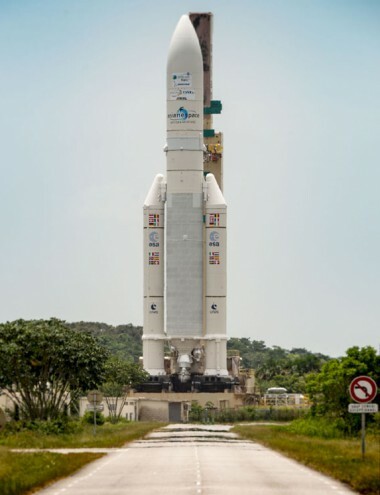 The Ariane 5 rolled out today from the Spaceport’s Final Assembly Building to the ELA-3 launch zone, where it is scheduled for liftoff during a 45-minute launch window that opens August 24 at 6:55 p.m. local time in French Guiana. For this upcoming Ariane 5 mission – which is designated Flight VA232 in Arianespace’s numbering system – the payload lift performance to geostationary transfer orbit is estimated to be 10,735 kg. This total includes the two Intelsat satellites, as well as the launcher’s dual-payload dispenser system and integration hardware. Riding as the upper passenger in Ariane 5’s payload arrangement is Intelsat 33e, which will be released approximately 28 minutes into the mission. The spacecraft was built by Boeing using a 702MP platform, and will operate from an orbital position of 60 deg. East. Intelsat 33e is the second satellite in Intelsat’s next-generation, high-throughput Intelsat EpicNG series, joining Intelsat 29e – which was successfully lofted on an Ariane 5 mission performed in January. Once in orbit, Intelsat 33e will meet broadband demand for carrier-grade telecom services, enterprise networks, aeronautical connectivity and media services. To be deployed from Ariane 5’s lower passenger position is Intelsat 36, which was produced by SSL (Space Systems Loral) based on its 1300 platform. The satellite’s separation will occur approximately 41 minutes after liftoff – completing the Ariane 5 mission on August 24. Intelsat 36 will enhance Intelsat’s media neighborhoods serving the South African and Indian Ocean region when starting operations from its 68.5 deg. East orbital position – where the satellite will be co-located with Intelsat 20, which was launched by Arianespace in August 2012. As the fourth heavy-lift Ariane 5 flight so far in 2016, tomorrow’s launch will continue a busy year of mission activity for Arianespace’s full family of launchers – which also includes the medium-lift Soyuz and lightweight Vega.